Review of A Fifteenth Century Cookry Boke, with a recipe for Prymerose. Take percely, and grynde hit wiþ vynegre & a litel brede and salt, and strayne it þurgħ a straynour, and serue it forþe. Take parsely, and grind it with vinegar and a little bread and salt, and strain it through a strainer, and serve immediately. Nym Rys, an bray hem wyl, & temper hem with Almaunde mylke, & boyle it; & take Applys, & pare hem, an smal screde hem in mossellys; þrow on sugre y-now, & coloure it with Safroun, & caste þ-to gode pouder, & serue forth. Most intriguing is the number of flower recipes. That “Fruit and Flower” chapter is not a bastardization of “Flour”, it means cooking with Primrose and Hawthorn flowers and something called “Flower of Rys” which might explain our recipe above. If you’re keeping score, the recipes come verbatim from the Harleian manuscripts 279 and 4010 (about 1430 and 1450, respectively), the Ashmole manuscript 1429, the Laud manuscript 553, and the Douce manuscript 55 (about 1450) from the British Museum and the Bodleian Library, courtesy the Early English Text Society. A Fifteenth Century Cookry Boke is intriguing for occasionally flipping through—you aren’t going to read it straight without going bonkers in the process—but you aren’t going to get much in the way of usable recipes from it. Unless, of course, you understand fifteenth century English, in which case, serue hem forth! Take oþer half-pound of Flowre of Rys, .iij. pound of Almaundys, half an vnce of hony & Safroune. Take þe flowre of þe Prymerose, & grynd hem, and temper hem vppe with Mylke of þe Almaundys. Plante þin skluce with Rosys. If you enjoy cookbooks, you might also be interested in A Concise Encyclopedia of Gastronomy, Bull Cook Historical Recipes, Cavalier Cooking, Classic Chinese Cuisine, Cooking the Bahamian Way, Country Commune Cooking, Life, Loves, and Meat Loaf, The Art of Korean Cooking, The Casserole Cookbook, The Complete Book of Oriental Cooking, The Complete Bread Cookbook, The Frugal Gourmet Celebrates Christmas, The Healthy Cuisine of India, The New Larousse Gastronomique, Saucepans and the Single Girl, The Northwest Cartoon Cookery, Good Food From Mexico, Laurel’s Kitchen, The Cooking of Vienna’s Empire, James Beard’s Fireside Cook Book, French Bistro Cooking, Crockery Cookery, Southern Cooking, The Frugal Gourmet Keeps the Feast, The Fannie Farmer Cookbook, French Cooking Simplified With a Food Processor, In Good Taste, Heritage of America Cookbook, Our Favorite Hometown Recipes Vol. II, The Indian Spice Kitchen, Japanese Country Cookbook, La Cuisine Française, Larousse Treasury of Country Cooking, The Natural Foods Cookbook, A Russian Jew Cooks in Peru, Soul Food Cook Book, The Tassajara Trilogy, Pains Spéciaux & Viennoiseries, Whole Earth Cookbook, The Wok: a chinese cook book, Southern Living Cookbook for Two, Lebanese Cuisine, The Art of Syrian Cookery, Popular Greek Recipes, In a Persian Kitchen, The Art of Pennsylvania Dutch Cooking, and The Southern Living Cookbook Library. Nicely odd book for your shelf, either your kitchen shelf or your gaming shelf! 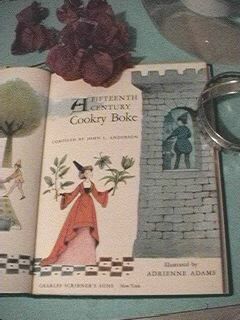 A Fifteenth Century Cookry Boke last modified March 4th, 2013.